Leaders of the Hollywood Park development in Los Angeles and Chase Center in San Francisco talk about adopting a mixed-use model to activate the projects. Stadiums are adopting a mixed-use model. 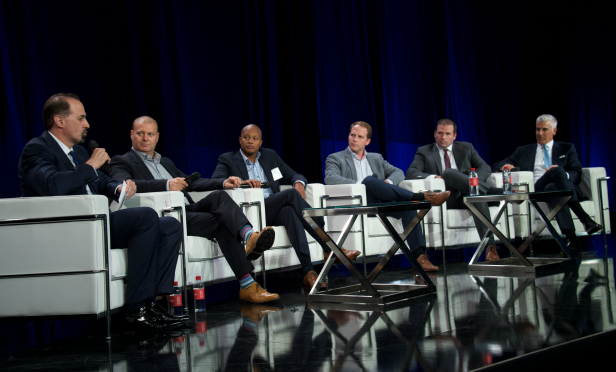 At Allen Matkins annual View From the Top conference earlier this week, Jason Gannon, managing director of the Los Angeles Stadium and Entertainment District at Hollywood Park, and David Kelly, general counsel and VP of the Golden State Warriors, said that they were integrating retail and food and beverage as a way to activate the projects and office space to provide additional cash flow. Gannon and Kelly spoke on the Landmark Development Projects panel, moderated by Allen Matkins partner Tony Natsis and with speakers R. Todd Doney, vice chairman at CBRE; Aaron Fenton, senior project manager at Boston Properties; and Kevin L. Ratner, president of Forest City West. The Golden State Warriors purchased land for Chase Center, an 11-acre stadium development project in Mission Bay South, and the site was already entitled for two office towers. They decided to build one of the office towers along with the arena, and found Uber to prelease the space and partner on the development project. “Uber took the space and became a joint venture partner on the project,” said Kelly. “That took some risk off the table for us and allowed us to focus on what we do best, which is building the arena.” Uber ended up being the perfect “synergistic” partner. One huge reason is because Uber doesn’t require parking—per the nature of its business—leaving the parking at the project free for the arena.